I spent all morning working on this tutorial, and I LOVE the results! 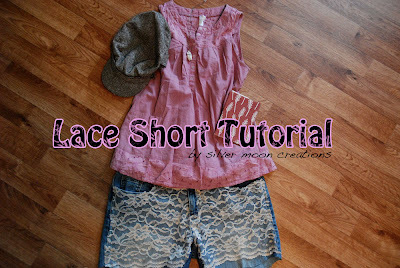 Step One: Cut off some old/worn/ripped and thrifted jeans into cute shorts, at whatever length you desire. Step Two: Lay a piece of lace over one side. Pin it into place, and lightly cut out the shape your shorts. You do not have to be exact, because we can always trim after sewing it on. Step Three: Begin sewing at the top. I used a straight stitch for these shorts. If your sewing machine is anything like mine, you will have trouble getting the thick part of the pants under the needle. Just keep working with it! WARNING: DON'T SEW OVER THE POCKET! YOU WILL SEW THE POCKET CLOSED (haha, I did that...<_<) I hand-sewed the tiny bit of lace over the pocket at the end. 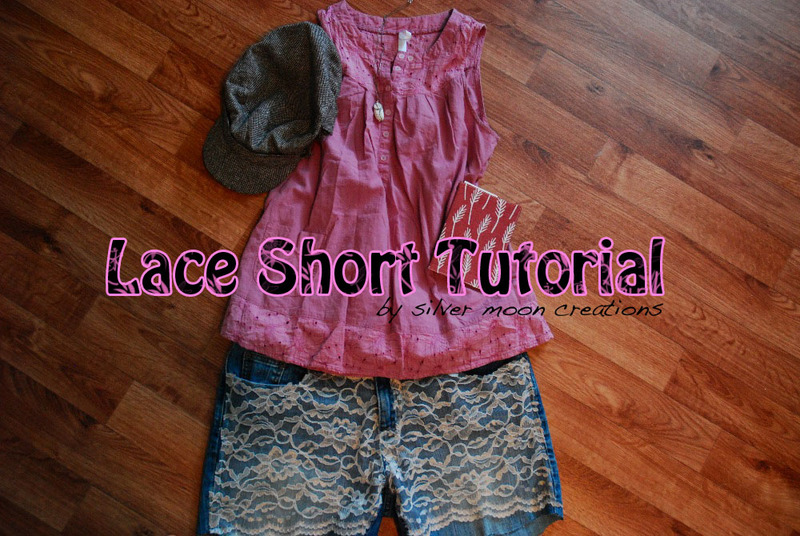 *I did not sew the bottom of the shorts, as that lace was the edge. Step Five: We are half-way done! Now, lay another piece of lace on the OTHER side, line it up with side one, and repeat from step two. At The End:Now, take a needle and thread and lightly hand-baste around the top of your shorts near the pockets (unless your sewing machine folds, and is magically able to sew pockets). I was so excited that I promptly made another pair. I made these in the same way. The only difference is when sewing horizontally, I used a zig-zag stitch to help with stretch! *If you want to know, both notebooks are from Marysza and the owl necklace is from Fausta.